In 1913, Englishwoman Elsa Pendleton Beazley, having put behind her a career as a governess and an unresolved relationship with her German employer, embarks with her much older husband Edward, a research scientist, on a journey to the eponymous South Pacific island. The couple are accompanied by Elsa’s mentally disabled, volatile younger sister Alice, to whom Elsa is both sibling and de facto mother. In parallel narratives, Vanderbes describes the movements of a German naval fleet pursued by British warships, which anchored off (and perhaps visited) Easter Island—and also the 1973 journey of Dr. Greer Faraday, whose mission is to study the island’s ecosystem in hopes of determining how plant life came to a seemingly barren island “Fifteen hundred miles from another landmass.” Vanderbes painstakingly fills in details of former experiences that have shaped her characters’ attitudes—notably (and a bit turgidly) Greer’s estrangement from her late husband Thomas, following allegations of academic fraud. 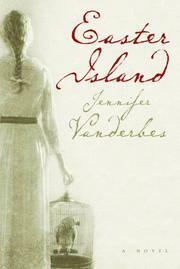 The heart of the story, though, is the island’s impenetrable mysteriousness, and Vanderbes extracts considerable drama and tension from questions not susceptible to final answers. What is the meaning of the fabled stone statues (moai), relics of an earlier age, that face inland toward what was once a wilderness? And of the stone tablets containing undecipherable pictographic writing (rongorongo)? Is there a recorded history that mocks its pursuers, or only mute ruined evidence of an island paradise destroyed by its contact with “superior” civilizations? A most satisfying partial resolution is given in the closing pages, focused on the fates of Alice and of the German fleet, as well as on the answers for which Greer Faraday eventually settles. Impressively researched, persuasively detailed: a first novel destined to become a reading club favorite.